During his State of the State speech Tuesday, Kansas Gov. Sam Brownback asked legislators to come up with a plan by the end of January to fill a $350 million hole in this year’s budget. “Our state has record population, record new businesses, record grain production and record income,” Brownback said. The governor acknowledged the budget problems but blamed them on downturns in the state’s agriculture and oil and gas sectors. He called on legislators to send him a bill within a month that wipes out a $350 million deficit in the current fiscal year. Senate Minority Leader Anthony Hensley and the Democratic caucus say repealing a 2012 tax cut is the first step toward improving the state’s budget situation. 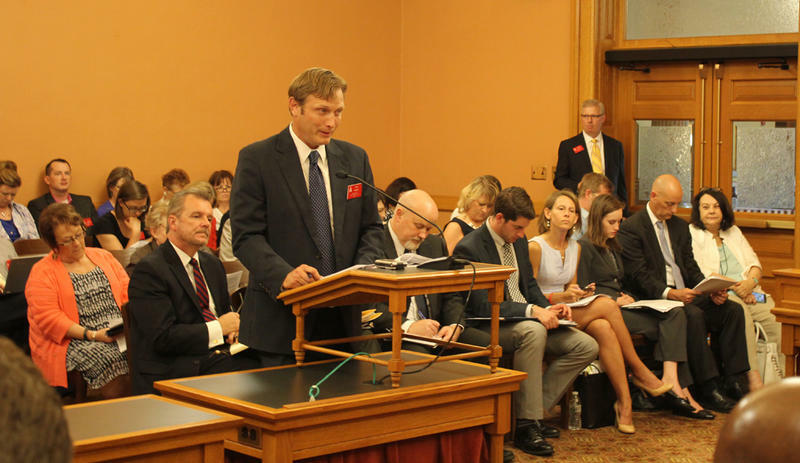 After Brownback’s speech, Senate Minority Leader Anthony Hensley delivered the response from a Democratic caucus that increased this year from eight to nine in the Senate and 28 to 40 in the House. Hensley called for major changes to Brownback’s signature 2012 income tax plan. He said years of budget problems that followed have compromised disability services, education, highways and the state’s credit rating. In addition to the new Democrats, the House and Senate also include a batch of new moderate Republicans who are skeptical of the governor’s policies. Reaction to the speech in the chamber was generally subdued. Here’s what he — and others — had to say about the state budget, health and education as the legislative session begins. For returning lawmakers the state’s budget problems are like a persistent nightmare. For newcomers, they’re just plain scary. The state could be awash in nearly $1 billion of red ink by the end of the coming budget year if nothing is done to balance revenues and expenditures. The most urgent challenge is the $350 million deficit projected in the current budget year. With the fiscal year more than half over, lawmakers must move quickly. But so far, they have received little guidance from Brownback. In his speech, the governor said he would deliver a balanced budget proposal Wednesday but provided no detail about what it would contain and seemed to indicate that he was prepared to have lawmakers do most of the heavy lifting. Brownback said the spending blueprint that Budget Director Shawn Sullivan will detail Wednesday will call on lawmakers to adopt several budget-cutting recommendations from an efficiency report commissioned last year. “The days of ‘tax first, cut never’ have come to an end,” Brownback said to tepid applause. Legislative leaders expect him to propose borrowing from a state investment fund that now contains about $360 million. Many lawmakers don’t like the idea, but House Majority Leader Don Hineman said they have little choice but to go along. But Hineman said he believes a coalition of moderate Republicans and Democrats who campaigned on “fixing the mess in Topeka” want to to take a different financial approach than continuing to do just enough to limp from one year to the next. “We need a long-term structural fix to this imbalance we have between revenues and expenditures,” he says. A bill already has been introduced to kick-start that structural fix by repealing a controversial business tax exemption. The exemption, part of Brownback’s 2012 income tax cut bill, has allowed more than 300,000 business owners and farmers to stop paying taxes on their pass-through income. Efforts to roll back the exemption failed in each of the last two sessions, but this year’s repeal bill appears to have widespread support despite Brownback’s continued opposition. “I look for the loophole to get closed,” said Sen. Jim Denning, an Overland Park Republican whose efforts to repeal the exemption last year helped him survive an election in which several conservatives were defeated by more moderate Republicans or Democrats. Hensley said repealing the LLC exemption alone will not be enough to provide a long-term budget fix. He said KanCare, the state’s move to privatize all Medicaid services since 2013 under three insurance companies, was an unqualified success. “Thanks to the leadership of Lt. Gov. Jeff Colyer, we have seen more Kansans served than ever before, steady or improving health outcomes for (KanCare) beneficiaries and dramatic cost savings to taxpayers of $1.4 billion,” Brownback said. An outside consulting group’s report on KanCare commissioned by hospitals and other stakeholders found that the program was having a limited effect on health outcomes and delivering on cost savings largely by squeezing providers. Legislators on both sides of the aisle — and Brownback himself — have said that reversing a 4 percent cut to most KanCare providers should be one of the first priorities this year. Rep. Chuck Weber, a conservative Republican from Wichita who gave the speech generally high marks, said he wished Brownback would have included a few words on restoring the 4 percent Medicaid cut. “We’re going to get that taken care of,” Weber said. Brownback also panned any attempt to expand Medicaid coverage to low-income Kansans under the Affordable Care Act, commonly called Obamacare. But new House Speaker Ron Ryckman has said the chamber’s more moderate makeup means it should at least have an open discussion about ways to access the federal money that expansion would bring to the state’s health sector. During his speech, Brownback also highlighted ideas to increase the number of health care providers in a rural state in which 92 of 105 counties are considered medically underserved. In addition to already-announced proposals to fund more medical residency slots and attract a private osteopathic medicine school, the governor said the budget he will unveil this week provides dollars to begin development of the state’s first dental school, at the University of Kansas Medical Center. “Let us begin working toward the future now, moving forward to address the chronic health care needs of our state,” Brownback said. He did not mention recent legislative pushes to allow the licensing of mid-level health care providers who can do more than nurses and dental hygienists but less than those who went to medical school. Physicians and dentists have traditionally opposed such bills. He also didn’t mention any plans to shore up the state’s ailing mental health system. Of all the vexing problems the Kansas Legislature faces in 2017, perhaps none is more complicated, financially and politically, than how to fund public schools. The state has funded education through a block grant scheme the last two years. Educators have denounced it and the courts have ruled it unconstitutional. So that’s problem No. 1: a new funding formula. “The most significant task you face is building a new school funding system that puts students first,” Brownback told legislators in Tuesday’s speech. Many legislators have called for a return, with some modifications, to the old formula that provided a base per-pupil payment to districts with upward adjustments for students who come from poverty, don’t speak English or even have a long way to travel to school. While many conservatives lost their seats in the last election cycle, a core group remains that will push for what is known as an outcomes-based formula. That could reward districts for, say, improving graduation rates or ACT scores and penalize districts that don’t improve. Brownback on Tuesday stated a strong preference for an outcomes-based funding formula, and Weber said that part of the speech appealed to him. 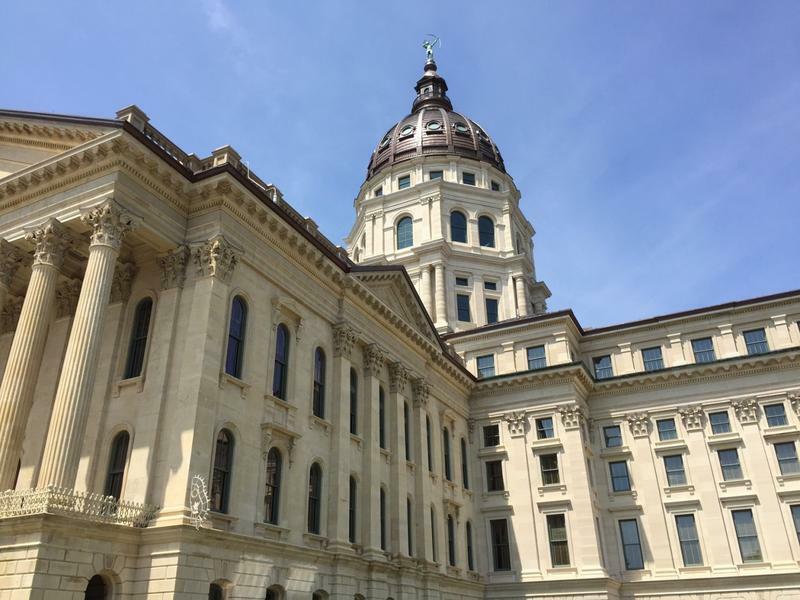 Some lawmakers say that before they commit to a funding formula, they need to know what sort of education Kansas kids should get. That’s problem No. 2: adhering to the so-called Rose Standards. These admittedly vague standards — which include communication skills, civil and social engagement, and career preparation — were cited in the Kansas Supreme Court’s 2014 Gannon school funding case. Since that time, the Kansas State Department of Education has worked to define the curriculum needed to fulfill those standards. Which brings us to problem No. 3: what the state high court will rule in the adequacy portion of Gannon. The Legislature is waiting for the justices to rule whether Kansas adequately funds public education. (In the summer the equity portion of the case was settled for $34 million.) By some estimates, a ruling of inadequate funding could cost the state up to $1 billion, which, by the way, is the deficit the state faces over the next 18 months. On top of that, some lawmakers will want to funnel more money into early childhood education and others will want to protect higher education, which took a $30 million cut this fiscal year. Brownback offered no suggestions on higher education funding. But he challenged the state’s colleges to offer a bachelor’s degree to in-state students for $15,000 total tuition or less and offered 50 state-funded full scholarships to the university that can do it first. With all those moving and expensive parts, some legislators suggest that writing a formula this session will be impossible and that the block grants should be extended for another year. That seems unlikely because the block grants already have been ruled unconstitutional. This story was produced by Andy Marso, Jim McLean and Sam Zeff of the Kansas News Service, a collaboration of KCUR, Kansas Public Radio and KMUW covering health, education and politics in Kansas. Kansas News Service stories and photos may be republished at no cost with proper attribution and a link back to kcur.org. 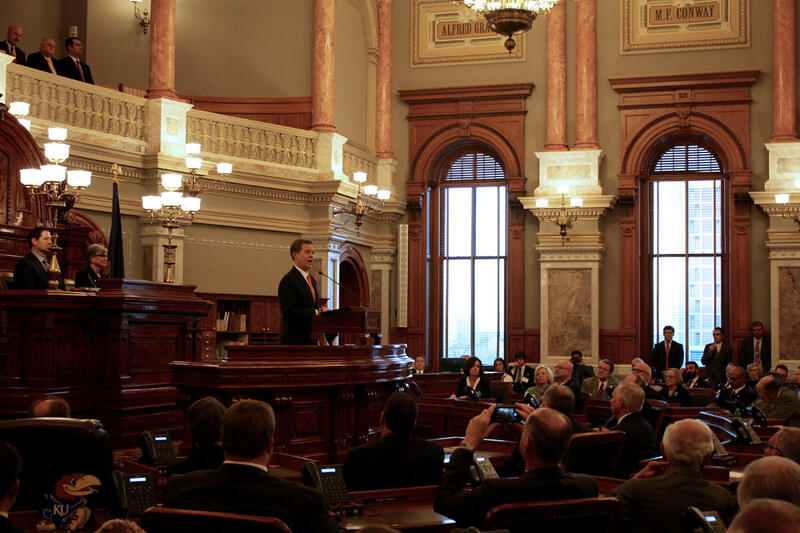 The Kansas Legislature began its new session Monday. State lawmakers face several big challenges this year, like filling a sizeable budget hole and writing a new school funding formula. Think twice and don’t be in such a hurry to repeal Obamacare. That’s the message that an alliance pushing for Medicaid expansion in Kansas is sending to members of the state’s congressional delegation. In tight budget times, Kansas mental health advocates are turning to the lottery for some financial help. 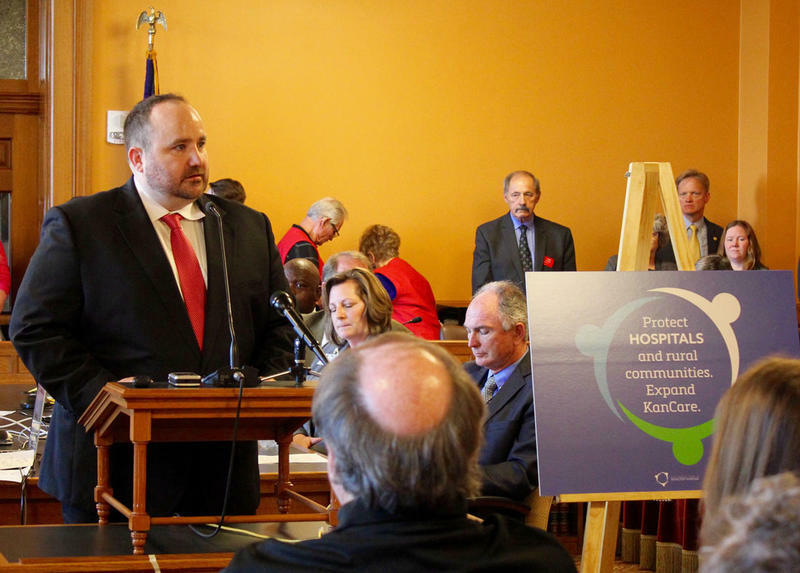 Kyle Kessler, executive director of the Association of Community Mental Health Centers of Kansas, said the association will ask the Legislature to commit an additional $31 million over the next two fiscal years for the centers. That $31 million — pulled from Kansas lottery proceeds — would return funding for the 26 centers across the state to the 2007 fiscal year level.